This is a jar of candy. 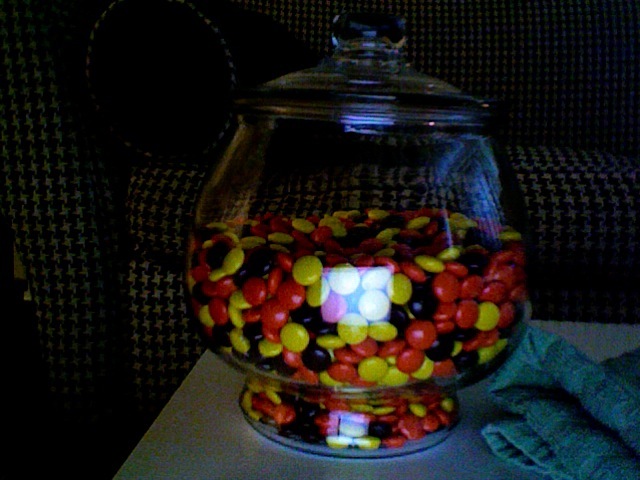 It is my jar of candy and it is filled with 3 bags of Reese's Pieces from the grocery store. I am not allowed to eat any of this candy. Other people are allowed to eat this candy, and I am going to keep the jar stocked (though I might alternate candies over time). The point of this jar is to train myself not to treat food as an option just because it is around. When I go to parties, or when I have food around my house, I snack like crazy on it. I just grab a bunch and start eating. Usually, I am not even hungry. So, this jar of candy is here for the express purpose of training myself not to snack just because the option exists. The candy dish sits out in the living room where I constantly get to see it. It is remarkably tempting, but thus far (umm, about a day) I have avoided eating any Reese's Pieces. did you come up with this plan on your own? You have unique approaches to common problems. I kept a candy bowl when I was in college and almost never ate out of it, yet replenished it on a weekly basis. I think this is a cool idea and hopefully will work out for you. I took a similar approach while I've been losing weight this last year and have been turning down free food whenever possible. At work people bring in donuts or bags of M&Ms and it's very easy to grab something even though I've already eaten breakfast and don't need a donut. Keep up the good work! Any luck with the candy? My friend Danielle pointed me over to your blog, and mentioned that you might be busy for a while at the moment, but I'd love to hear how your candy experiment went, even if it didn't work out. I think the principles are sound, but the task itself is challenging and would seem like it would require great restraint-fu but pay off handsomely if it worked out.